My first standard distance duathlon and an attempt to qualify for the 2019 ITU Duathlon World Championships! Prepare for mishaps. As storm Callum rolled through the Midlands at the end of the week the forecast for the weekend was uncertain and changing by the minute. 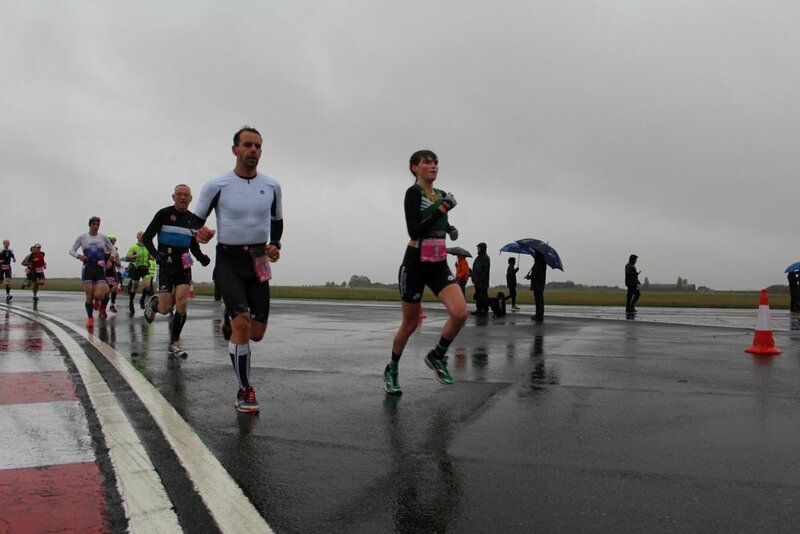 However, rain or shine I was off to Bedford to race the Bedford Autodrome Standard Distance Duathlon and attempt to qualify for the 2019 ITU Pontevedra Standard Distance Duathlon World Championships. Although Bedford ended up being a 90 minute drive from Nottingham I opted to stay in Bedford Priory Marina Premier Inn overnight to save any race day hassle. Premier Inns are a great choice for cycling holidays or race travel as they are quiet, consistent and allow clean bikes in all their rooms. This one was no exception and after a fantastic feast at The Cochin Indian restaurant (think massive trays of Thali with salted lemon juice) we settled down for a peaceful night’s sleep. After a few days of horrendous winds, I was relieved to wake up to a relatively still day. The weather couldn't let it be that easy though. What the day lacked in wind it made up for with torrential downpour and temperatures that struggled to reach 10C. This made kit choice tricky. I had packed for every possible weather situation but still needed to decide the best combo to wear. Since the wind had piped down I could use my Liv Envie Advanced Pro 1 race bike with Giant SLR 1 Aero Wheels without fear of blowing away. This was also my last race in my Mizuno Wave Riders as I'm starting to break in my On Running Cloudwaves for the next race. In the end, I opted for a tri suit (UoN represent) with a long sleeved base layer, normal cycling socks, and my fingerless Castelli mitts. I think this was the right choice for the majority of the race however in future I might look out for some calf sleeves as my calves felt frozen during the second run after getting chilled on the bike. The first 10km run seemed to feature the heaviest rain, with the racetrack waterlogged at every bend. It was mass start everyone in the sprint and standard distance races setting off at 9am. I tried a little jog with a few drills and strides before reluctantly handing over my coat and finding a spot on the start line. After a wet race briefing, featuring many pleas to take it carefully on the bike course, we were off. The standard distance, 10km, was 4 laps of the run course to start. Everyone seemed to go off so fast! However, as we came round to lap 2 many of the faster athletes peeled off, they were doing the sprint distance, not the standard. I paced myself and tried to stay in the top couple of women without overdoing it, there was still a long way to go. T1 was a welcome interlude and I looked forward to a change of shoes and a visor to keep the lashing rain off my face. Unfortunately, while I had been out running in the rain my kit had been slowly collecting the cold water. In my hurry I grabbed my helmet and shoved it onto my head, emptying a large amount of freezing water over my head in the process. Still, in shock, I stuck my feet into my wet cycling shoes, un-racked my bike and waddled out of transition as a few spectators chuckled at my misfortune. Onto the 8 lapped (39km) bike course, the conditions were still terrible. My first few laps were accompanied by the sound of carbon on concrete and the sirens of the ambulance as many riders got overconfident on the corners. Luckily I managed to keep the rubber side down throughout the bike leg. I was cautious but still seemed to be overtaking many people while no women overtook me. After the first lap, I decided that the visor had to go. The Giro Aerohead conveniently is attached magnetically either in the up or down position so it was easy to pull off and flip up while going along. The luck didn't last very long though. Near the end of the bike, I suddenly couldn't remember how many laps I had done. Was I on lap 5 or 6?! I decided to do two more laps and then see what the distance on my wahoo said. Sadly the distance on the wahoo didn't seem to help. Either the course was 2km short or 3km long and I didn't know which! In the end, I took the safe option and did the extra lap. While representing UoN in team kit I didn't want to "cheat" and do too little laps, even by accident. Finally, I left the soggy bike course behind and after an uneventful T2 was out on the final run. Despite having the only 5km to go after a long 2 hours of racing it felt like a long way. My calves were starting to burn after getting chilled on the bike and my brain was filled with the concerns over my bike leg. Had I done an extra lap? I pushed on with the 2 lap run and was relieved to eventually cross the finish line. Medals and bananas awaited finishers at the end, as well as the chance to finally get dry and warm. A chip van was serving up some top quality post-race nutrition with lashings of salt and vinegar. Results were printed off live in a small tent in the race HQ. I was fairly pleased with my run times; they were about what I expected. The bike time however still didn't give away whether I had done the correct number of laps or not. It was Strava that finally gave me the answer. It turns out that some genius in the past had not only made a segment for the correct 8 laps but also a bonus segments for everyone that struggles to count to nine. After uploading my ride I quickly discovered my name in the leader board for the 9 lap bike course segment. That final lap had added an extra 8 minutes and 16 seconds to my race. Regardless of this, I had still achieved a respectable 12th out of 30 women with a bonus 2nd in my age group. The purpose of this race was to qualify for 2019 ITU Duathlon World Championships meaning I needed to achieve a time within 115% of the winner. I believe my time fulfils these criteria so remain hopeful that I will still qualify, fingers crossed! The preparation now starts for BUCS duathlon. It was great to already have a duathlon under my belt nice and early in the season. I can now work on the weaknesses that this race has highlighted, starting with learning to count.